As I warned you to expect, there wasn’t anything particularly dramatic in the new results, reported at the HCP conference in Kyoto, on the Higgs-like particle. There just wasn’t enough new data relative to what was available in July for that to happen — a bit less than double for most measurements. That said, there were some interesting developments. Here’s are the summary plots from ATLAS (left) and CMS (right); things are a bit more consistent with the Standard Model Higgs hypothesis (especially for decays to tau’s, b’s and W’s) than they were before, but the precision of the measurements is still pretty low. 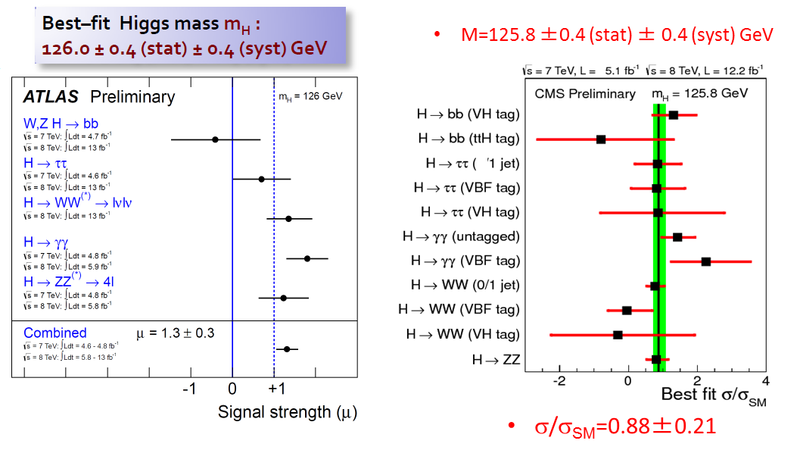 The measurements looking for signals of a Higgs particle at ATLAS (left) and CMS (right). For each process, the dot is the measurement of the rate relative to the Standard Model expectation, and the horizontal bar gives the one-standard-deviation uncertainty. Note all measurements are within two standard deviations of expectations. Some measurements (photons for CMS and ATLAS, ZZ* –> 4 leptons for ATLAS) were not updated for this conference. For details, see the previous post. Also notable: that the Tevatron experiments’ measurement of Higgs decaying to bottom quarks is now smaller than before and more in line with Standard Model expectations; that the ratio of W to Z coupling strengths is consistent with a simple generic Higgs [i.e custodial symmetry works with uncertainties of 30%]; and at 2.5 standard deviations this is not a parity-odd spin-zero particle, while it remains consistent with being the parity-even spin-zero particle that we’d expect a simple Higgs to be. For many more details, see my previous post from Kyoto. This entry was posted in Higgs, LHC News, Particle Physics and tagged #Tevatron, atlas, cms, Higgs, LHC. Bookmark the permalink. With current data this is the only result worth commenting, and I must say it makes me think this particle is its own isospin and will leave us uncertain as the any exact mass. I realize this is unprecedented and off-beam in the theory game, but there is not the hair of a hide of a conventional isospin at this point. As with all the other new physics (no capitals here! ), its no comment all the way, but such is the shock of the new. How intrinsic parity of a particle experimentally determined? The SM Higg’s abandoning of “gauge invariance”(electroweak symmetry breaking) is scalar- ie have even parity with spin “0”. We can never measure the spin of a particle exactly, and the best we can do is measure its total spin, and its projection along a certain axis. The spin along the other two axes remains a mystery, because as soon as we measure its spin along one axis, the other two components of spin become indeterminate. When the J/ψ is in state spin 0 what really mean is that it has “hidden” its spin at 90 degrees to the axis, so it’s total spin is still 1 and its projection along our chosen axis is 0. If we really have seen a spin 0 boson then we must see it decay to γγ, ZZ∗, bb¯ and ττ. Total spin CAN be measured exactly, and that’s what we’re measuring about the Higgs particle. Your statement about the J/Psi is linguistically wrong. The spin (meaning “total spin”) of the J/Psi is always 1; it never changes, and that’s what people mean when they say “the spin of the J/Psi”. It is never “in state spin 0”; that’s not the right language. It’s “spin component along a quantization axis” can be zero, but not it’s total spin, or simply, “spin”. Parity is a conserved quantity. When the new particle decays to two lepton/anti-lepton pairs, the state of the leptons and antileptons has the same parity as the new particle. Study of the momentum and angle distribution of the leptons and antileptons reveals the parity and the spin of the new particle. It turns out that determining the parity requires less data than determining whether the particle has spin 0 or 2. Fascinating post! As a fellow science-lover, I thought you might be interested in theoretical physicist Sean Carroll’s new book about the Higgs boson, The Particle at the End of the Universe. I’m happy to share more info with you and send a review copy if you’re interested. I know Sean very well and assisted him with checking the details in the book — which I highly recommend to my readers. What are the realistic statistics representing the odds that the Higgs Boson may not actually exist at all? ( 0%, 5%, 50%, 100%) After all, 50 years of looking can make anyone a little stubborn. How much of the impetus of this project has been the emotional need to find this elusive and possibly existing thing after trying so hard unsucessfully and for so long a period of time? I mean no disrespect, it is a valid question. We ‘know’ that a *higgs-like* particle exists with great certainty, far better than 99.9% sure. But whether it is *the* Higgs is a bit more tricky, especially as you have to be specific about what you mean by ‘the’ Higgs; the lightest of a family of Higgs particles? A super-symmetry compatible Higgs? Something that isn’t a Higgs but looks like one? All of these are possibilities being tested, and their chances of being right are hard to figure out change with every update to the data. We’re too early in to even say which broad possibility is most likely. Pingback: Desperately Seeking SUSY! | Whiskey…Tango…Foxtrot?